Lately, the automotive world has been focused on self-driving technology. But automakers are also developing ways to make vehicles more fuel efficient, regardless of whether someone is behind the wheel. Honda says its new Clarity fuel-powered sedan, set for release before the end of this year in California, has achieved a 366-mile rating in Environmental Protection Agency (EPA) tests. Honda says that translates into a 68 miles per gallon (MPG) rating. Honda vice-president Steve Center says this achievement should not be minimized. "Not only does the Clarity Fuel Cell fit five passengers and refuel in three to five minutes, it offers customers a driving range on par with gasoline-powered cars," Center said. "The Clarity leads the pack with a 366 mile driving range rating, and with a growing network of hydrogen stations and fast fueling time, the zero-emissions family road trip is no longer science fiction." Environmentalists and government policymakers tasked with reducing pollution from vehicles have been increasingly enthusiastic about hydrogen fuel cell technology. According to the state of California, these engines produce zero emissions since they produce electricity to power the vehicle. Where a hybrid uses a gasoline-powered engine to recharge a battery and a purely electric vehicle is powered by a battery that is plugged into an electric outlet for recharging, the fuel cell uses hydrogen to power the battery. 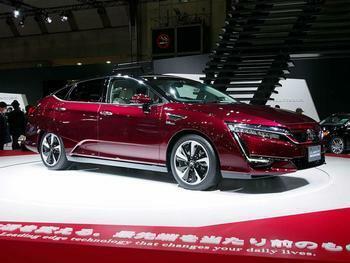 Honda says it will roll out the five-passenger, hydrogen-powered Clarity Fuel Cell sedan by the end of this year. It will start by making them available for retail lease at 12 approved fuel cell vehicle dealerships in certain California markets. The network covers six dealerships in Southern California, five in the Bay Area, and one in Sacramento. Honda said it will expand its dealer network as more hydrogen fueling stations become available.